One of the less publicized battles taking place, is the one for control of the streaming music industry. This past June, Spotify announced that it has 100 million subscribers. But of this total, only 30 million are paid subscribers. The remaining 70 million listen to a free tier of service that is supported by advertisements. Apple Music's 15 million paid subscribers (Apple doesn't offer a free ad supported tier of servce) is half the number that Spotify has. The difference is that Apple Music is about 15 months old while Spotify was founded more than a decade ago. In other words, Apple is picking up some ground and will eventually overtake Spotify if everything remains the same. Now, Apple is looking to speed up this process by undercutting Spotify on price. A new gift card offered by Apple gives buyers 12-months of service for $99. That brings the monthly rate down by 18% to $8.25. That would take the monthly cost of Apple's streaming music service under Spotify's $9.99. Currently, both charge the same thing for a month of streaming music for an individual. The gift card is available at brick and mortar Apple Stores, and cannot be purchased online from Apple. Not all Apple Stores are selling it yet. If you can't get to an Apple Store, eBay is selling both the 3-month card ($29.97 or $9.99 a month) and the 12-month card ($99 or $8.25 a month). Obviously, Apple is trying to get you to commit to a full year of streaming music. 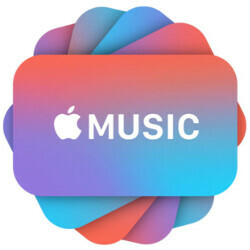 If you're interested in the Apple Music gift card, visit your nearby Apple Store, or click on the sourcelink to purchase it from eBay. If you make the purchase from the online auction site, you will receive a code by return email that you can use to start the subscription immediately. Hope this won't affect what the artists are making. If anything they should be getting paid more. Ummmmmmm.....there aren't any streaming services that offer that. I agree, the quality of FLac files are much better, but most people can't hear the differences you or I can. So, streaming services are their best bet. Doesn't change the fact that streaming services are a ripoff. If you're only listening to each album/song once it's a good deal of you're listening to a new album every day. However if you're like most and listen to each song several times and dozens of times to the hit songs it becomes a waste. For the same money I'd rather buy the CD and actually "own" rather than rent. Tried Apple music for three months. What a mess UI. Couldnt deal with it went back to Spotify. I'm using Google Play Music right now. I've been grabbing the $1 album deals they release every two weeks and I'm actually accumulating a pretty decent music library for dirt cheap... right now I'm around 2,300 songs. Though some of that is from CDs I've uploaded to the cloud. I think in the long run, it's definitely the best deal. Google also has a not quite daily free song/album but i can't post link to the site that keeps track yet.